After the morning session, children are the responsibility of parents, guardians or sponsors. In practical terms this means that children under age 7 should always be with a responsible caretaker. You can hire a baby sitter (check with youth), or swap childcare. But, since this is a family camp, we urge you to take advantage of all the things you can do with your children. While many children are able to function independently at camp, they are still the responsibility of parents, guardians or sponsors; it is up to these individuals to set limits and/or grant freedoms to the children in their care in accordance with their level of maturity. These adults are also responsible for monitoring behavior of children in their care, even if they allow the children to be independent on the Seabeck campus. For children of all ages, it is the responsibility of parents, guardians and sponsors to mediate any issues that arise with the children in their care. 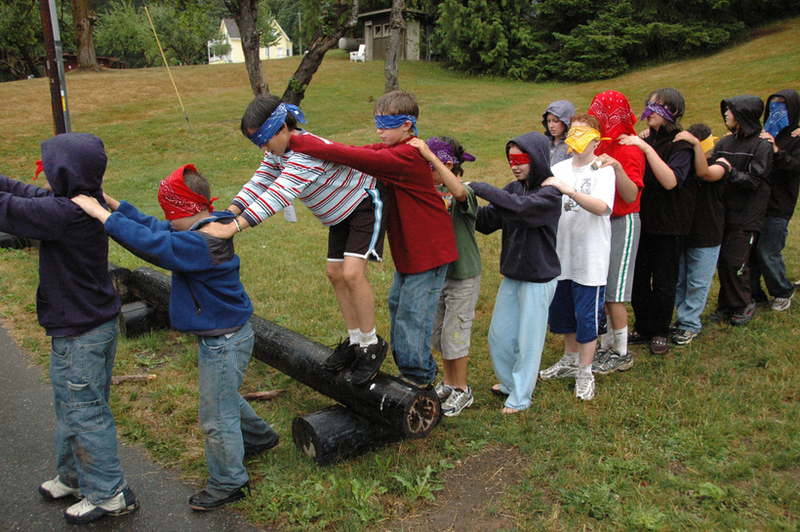 It is not the responsibility of camp staff to resolve behavior issues that occur outside of the morning program, with the exception of serious violations of camp rules, which will be addressed by the Board Representative, as needed. Children and youth under age 18 who have demonstrated a need for supervision, according to the sole discretion of the Board Representative, should always be with a responsible adult or guardian 18 years of age or older. Older children and youth may become very independent of their parents or guardians. Eliot can provide a chance to give them some freedom. Please consider, however, what is age-appropriate and supervise them accordingly. Safety is the number one concern. Some parents become concerned that they are not seeing enough of their older kids. Different families handle this in different ways. Some eat at least one meal together or have a daily check-in time. Feel free to set rules for your family that meet your needs. Eliot Institute is concerned with your child’s health and safety as well as your child’s overall positive experience at Eliot. All of the staff working with children and youth have agreed to ethical standards in their work here at camp. We have also set up health and safety guidelines for your children’s time here. Please become familiar with the following guidelines. 1. Snack. Food allergies and special dietary needs should be explained on your child's medical information form, as well as information about specific medications or medical conditions that staff should be aware of. The Children's Program Director will share information as needed with teachers and take dietary needs into account when planning the morning snack. We serve age appropriate snacks during the morning program and in particular, take care to avoid choking hazards for children under four. If you are the parent of an infant or toddler, please let the baby care givers know what type of snack your child may be ready for. Please label all containers brought into the baby room. We also ask that toddlers not bring toys with small pieces or coins to the classroom. 2. Playground. Children of all ages enjoy the playground equipment and several classes may be using playground areas in the morning. Parents are responsible for supervising their young child on the playground any time after the morning program. 3. Child protection and safety. A first-aid kit is available at the Inn and in each classroom area. Any children playing near the swimming area need close supervision by a parent. The Lifeguard is not responsible for children playing in or near the sandy shore. 4. Wasps and Yellow Jackets inevitably establish nests in the wooded areas around Seabeck. Parents of children with known reactions to stings from such insects should take precautions. Youth and children's curfew is 11 p.m., unless set earlier by parents or program staff. Youth may stay out for youth activities until 1 a.m. provided they are in a designated youth area and have two adults, age 25 or over, present. After curfew, children and youth should be in their sleeping quarters or with a parent or sponsor. Children must obtain permission from a parent or sponsor whenever leaving the Conference Center grounds, including trips to the Espresso Stand or Pizza Parlor across the street. Parents and sponsors are responsible for their children following the morning program and through the balance of the day, especially around the playground equipment and the waterfront. Cooperative childcare is encouraged, or parents may hire a youth. Skateboards, scooters, riding toys, guns, squirt guns and similar toys are not allowed in camp.